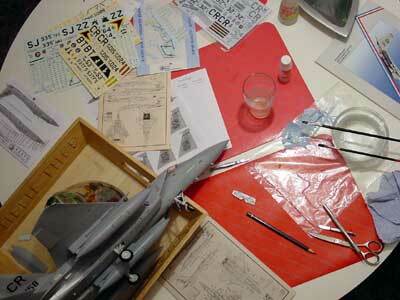 The F-15 two seater kit of the F-15B was now further finished [kit B]. The older style F-15's such as the F-15B had wheel hubs with more cooling gaps. 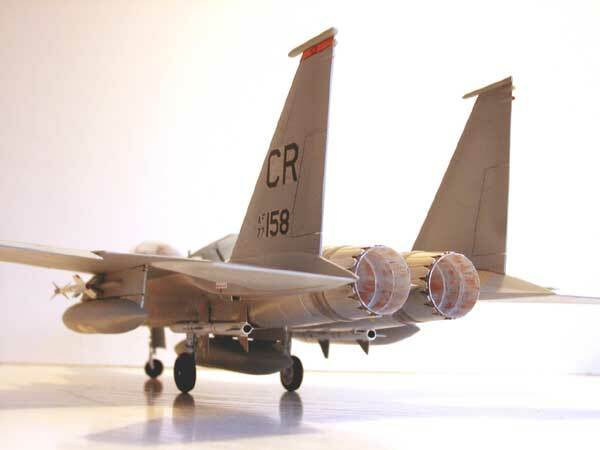 The kit parts are for later F-15's such as the C/D/E. 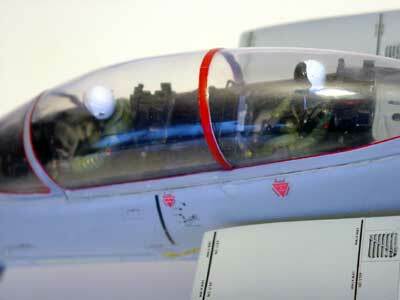 The gaps were filled with white glue and painted black as the earlier F-15's often had. So this error is not longer really obvious. As stated earlier also, older type F-15's had exhausts with the Turkey feathers installed. 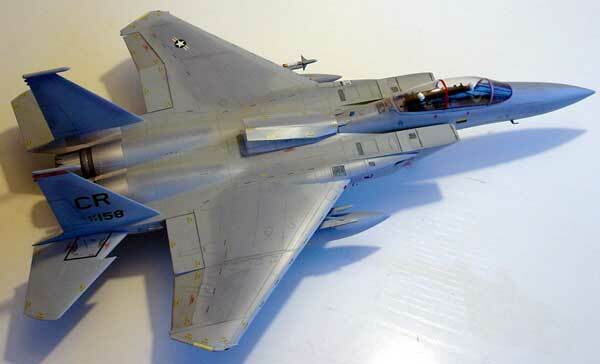 The same applies for the F-15B kit. 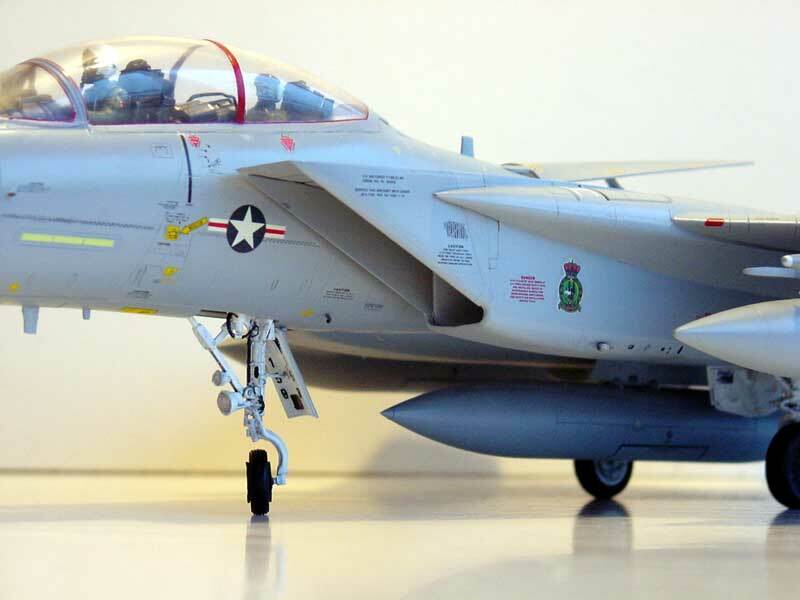 The decals of the F-15B from 32 TFS came from various separate decal sets. There are a lot of detail differences between particular aircraft, but for the F-15B there are only a few options as each squadron had a few trainer planes only. 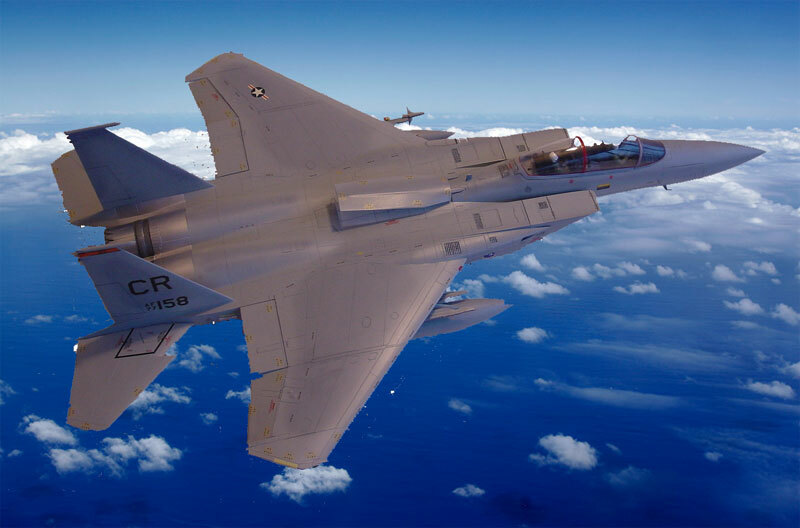 A sisterplane F-15B is seen above, having a clear picture of a real plane is important. Decalling takes at least 10 hours, so... be patient! The end results are very nice however. The decals were applied after putting on a couple of gloss coats on the model of Johnson Klear/ Future. A real gloss underlying finish is essential to prevent "airbubbles" that cause "silvering". Decals were applied, using Microscale Sol & Set in places to get a good flexible decal to curve to the lower surfaces. After putting on the decals, the model was left 24 hours to dry. 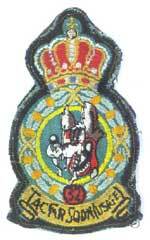 Some cleaning was done with a soft cloth a water. After ample drying time, the model was given a semi-matt end finish with a sprayed coat of Johnson Klear/Future mixing with some 15% Tamiya acrylic X-21 FLAT BASE. 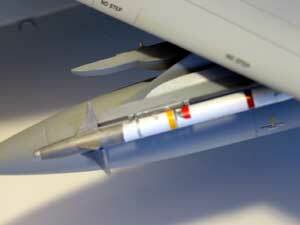 A Sidewinder air-to-air missile was installed from the TAMIYA kit and set in place. Exhaust pipes with turkey feathers in place were painted white inside with brownish/black burned striping. Upper view, the air brake being in the just opened position. The kit was made as a taxiing plane, with its nose wheel turned. A very nice model of the important American 32 TFSquadron that flew in The Netherlands at Soesterberg Air base, starting with F-86 Sabres in the fifties and ending with F-15C/D's before the turn of the previous century.